There is no case file in the Blue Book system for this sighting. There are also no other sight- ings in the area in the Blue Book system that verifies something was in the area. 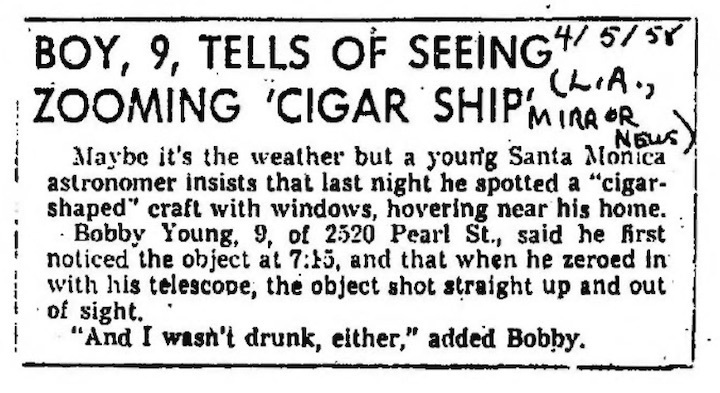 Loren Gross wrote about the case in his “UFOs: A History 1958 March—April”.3 The origin of the entry comes from a very short news clipping involving a 9-year old, who saw, through his telescope, a cigar shaped UFO with windows hovering near his house. The object then “shot straight up and out of sight”. The boy also commented that he was “not drunk”. The time listed was 7:15 but no PM or AM was given. Considering the fact, the boy was outside using his telescope, and it was a Friday during the school year, it can be assumed it was probably an evening event. The newspaper report is disturbing in that a 9-year old had to point out that he was not drinking. One also has to wonder about how accurate a report from a 9-year old could be. How much of his observation was influenced by flying saucer movies and stories? Putting that all aside, we have to wonder what direction he was looking and what the elevation angle was. That data is missing. In 2019, the houses in this area are tightly packed with little in the way of open yard space. Even 1952 aerial photographs show the same design.4 The most open viewing areas are on the Northwest and Southeastern sides of the house. While this does not mean that was the direction the witness was looking, it is least obstructed. There were no significant astronomical objects in these direc- tions. However, the moon and Jupiter were rising in the ESE. The astronomical conditions at 7:15 PM PST was that nautical twilight had just ended. The sky was getting dark and anything that was visible was either very high reflecting the setting sun or lit by its own lighting. The rest of the story can’t be really evaluated because we don’t have any other details. However, we can examine possibilities. The description does not match an astronomical object but it does tend to match things like a balloon or aircraft. 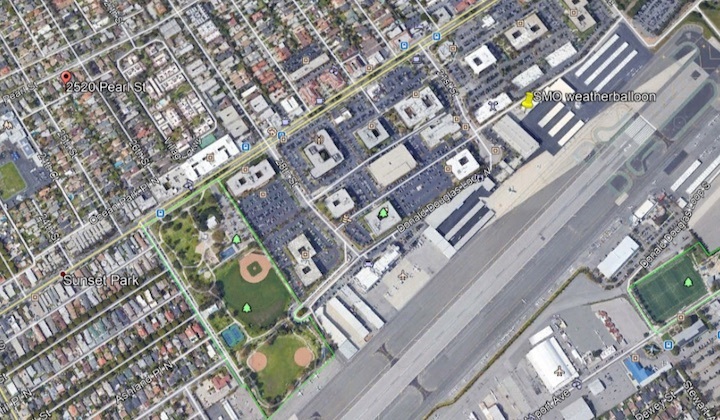 If the witness were looking towards the Santa Monica airport, which was 1/2 mile to the east, a balloon launched from there would have appeared to have drifted away from the observer as it rose. This would make it appear to hover/stand still. If the balloon burst, or had a change in wind direction, the balloon would have appeared as if it “shot straight up”. It is also possible that it was a high altitude aircraft that caught the setting sun or lit by its own lighting. When the lighting changed or it was no longer sunlit, the plane would “disappear”. At best this is a case of “insufficient information”. However, with more information, I suspect this case could be explained. Based on what information we do have, it seems possible that what was seen was a balloon or aircraft. A 9-year old’s telescope could not have been something of premium optical quality and one has to wonder if the boy’s imagination took a blurry object seen in low light and turned it into a cigar with windows. I also have to wonder how this can be considered “best evidence” if it came from a very young individual, who was never interviewed by anybody but a newspaper reporter wanting a flying saucer story to sen- sationalize. At this point, I would consider it possibly a balloon/aircraft and it really cannot be considered “evidence” of anything significant.